Both are highly recommended. Unfortunately, none of them brings the standard commentaries. What I miss most are the sources the Rambam uses for his various rulings. As is well known, the Rambam himself doesn't bring sources but those are incredibly useful to understand the why. For instance when the Rambam writes a father is allowed to but shouldn't marry his underage girl, it would be helpful to know this comes straight from the gemara in Kiddushin 41a. What are recommendations on editions of the Mishne Torah which bring those sources? Ideally they should come with a clear and recently printed text, as little Rashi script as possible, abbreviations spelled out and a reasonable price (200-250$ would be an ideal range). Mosad Harav Kook's Rambam LeAm might be such an option and your opinion of it would be most welcome. I think the Frankel Rambam contains what you are looking for. It has the standard commentaries on the page, such as Maggid Mishnah, Kessef Mishneh, Radvaz, Lechem Mishneh, Migdal Oz, Rabbeinu Manoach, etc. It also has a section in the back where it lists dozens of other commentaries that speak about each individual halacha. The text is very clear, and it provides textual variants as well. You can get the entire new set (17 volumes or so) in the small size for $300 - $350. If that is too expensive, they also have a cheaper set that does not have the additional material in the back, but still has the standard commentaries on the page, in a few volumes. Additionally, they sell the volumes individually as well, if you don't want to spend so much money at once. The standard edition, out of copyright and republished by many publishers over the years, sounds like what you want. It's got Raavad, Kesef Mishne, Magid Mishne, Lechem Mishne, Hagahos Maymaniyos, and more. In particular, it has Migdal Oz, which cites the Mishne Tora's sources. Because this edition has been published by so many, I can't recommend a publisher, but if you ask a Jewish bookseller for the standard old-fashioned Mishne Tora, you'll probably get it. It's also (I'm guessing) the cheapest edition with commentaries on the market. A downside is that the print is not as crisp as some newer editions'. And another thing to note (and you may consider it a downside) is that it has the text that everyone had for years, which had been censored to avoid insulting Christianity too much, rather than a more original text that some newer editions have. Here's a picture of a page. This edition is specially made for Chabad program. It contains a lot of bibliographic references. But the font is very small, it's tiresome to read for hours small letters. It's better than mifal Mishne Tora because of the wide mare mekomot, Raavad is not skipped, for travel it's good. To skip the Raavad is a pity, because notes of Raavad on Rambam are very short and show the reading of this big genius. There is a pocket version of Eshkol edition, which is also vowelized, and easy to read with a beautiful font, as all Eshkol books. This edition contains Magid Mishne, the most important comment, the "Bartenura of Rambam", the most pleasurable reading which gives us sources of Rambam in a marvelous Hebrew style. This comment upgrades lecture and lector. IMHO this kind of edition is the best. 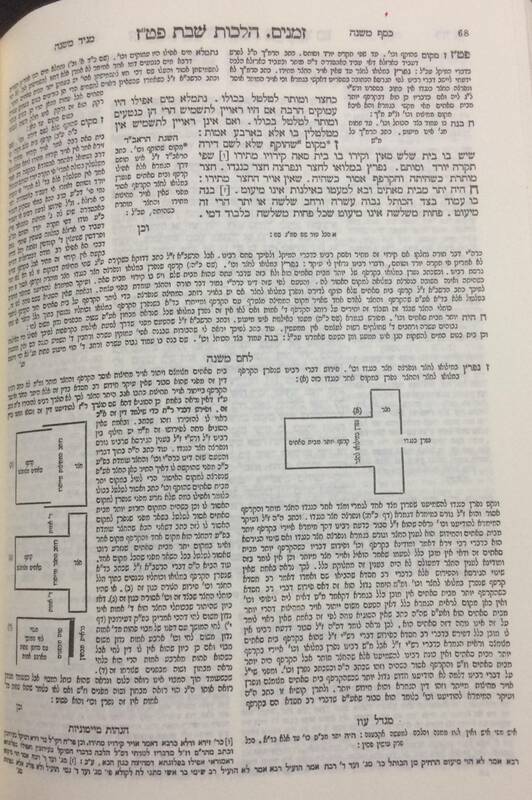 This pocket edition (מפעל משנה תורה) is not beautiful but the text follows manuscripts, but there is missing Raavad notes and Magid Mishne comment. I don't recommend it. Not the answer you're looking for? Browse other questions tagged product-recommendation jewish-books mishneh-torah .